Heading into Hamilton, USA sit top of the standings for the first time and are closely followed by Rugby World Cup Sevens 2018 champions New Zealand and Olympic gold medallists Fiji in third. The competition kicks off at 10:00 local time (GMT+13) on Saturday, 26 January when Scotland take on France before the other Pool C match sees series champions South Africa, who placed fourth in Dubai, face Kenya. New Zealand captain Tim Mikkelson said “Its good to be back and be back training with the boys and especially in Hamilton, where I’m from. To play in front of the home crowd is something I’m really looking forward to. “The boys have played extremely well. In Dubai they had a lot of injuries and they didn’t complain about it, they just kept on moving forward and got the job done. Watching them in Cape Town they did the same thing. It was pretty inspirational and it's awesome to be back a part of it. 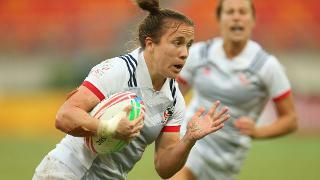 “We’ve got Japan first up and we really just want to start well in that first half. There is a lot of pressure playing here in front of our home fans, but we really want to do a good job at home and our families”. Also speaking at the captains’ launch, South Africa captain Philip Snyman added “We definitely have not had the best of starts this season, but I think the more our team play together and the more time they spend together the guys will gel.